The top ten college teams from the Atlantic Coast Conference compete for their conference championship during this six-day event, featuring fifteen games. 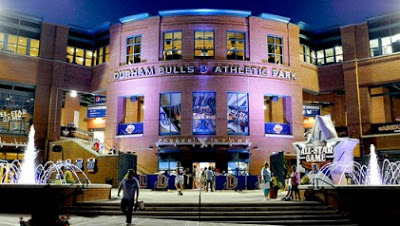 Root for your favorite college teams at the Durham Bulls Athletic Park in the heart of Downtown Durham. The stadium was designed and built so that every seat fives fans a great view of the field with an intimate ballpark feel. After a 19 million dollar renovation in 2013, Durham Bulls Athletic Park had a brand new playing field, improved field lights, new seats, upgraded video displays and sound system. In addition, there is a 5,000 square-foot upscale place for premium ticket holders and groups looking to host special events. This fun event starts with the ACC Baseball Fan Fest, a free event with live entertainment, food trucks, merchandise, and family fun. The 10-run rule is in effect for the entire tournament except for the Championship game on May 29. Morehead Manor Bed and Breakfast of Durham, North Carolina is the perfect place to stay during your ACC Baseball Championship game watching. We offer luxurious accommodations and a fresh gourmet breakfast each morning. We look forward to hosting you. This entry was posted in Uncategorized and tagged ACC Baseball Championship, downtown Durham, Durham, Durham Bulls Athletic Park, Morehead Manor Bed and Breakfast, stadium by admin. Bookmark the permalink.